The new one ounce fine gold bullion coin issued by the United States Mint looks is called a buffalo, with an Indian head similar to 'buff' nickels. We received our first shipment on Tuesday 4th of July, American Independence Day. The new American Buffalo Gold coin's obverse and reverse designs feature images originally prepared by noted American sculptor James Earle Fraser, once a student of Augustus Saint-Gaudens, for America's 5-cent coin (nickel). The Native American depiction on the coin's obverse is believed to be based on three different Indian chiefs - two of whom were named by the designer as Chief Iron Tail and Chief Two Moons - who modeled for Fraser as he sculpted its design. Conflicting statements exist on the third Indian as being either Chief John Big Tree of the Onondaga tribe, or John Two Guns, son of White Calf. It is widely believed that the bison on the coin's reverse was modeled after "Black Diamond," a popular attraction at the New York Zoological Gardens. In the first year of the coin's issuance, 1913, there were two distinct varieties, the first showing the bison on a mound and the second with the base redesigned to a thinner, straight line. American Buffalo Gold Coins bear the original Fraser Type I design. 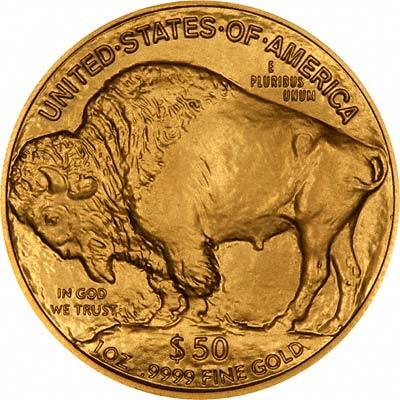 American Buffalo Gold Bullion Coins are the first .9999 fine 24-karat gold coins ever struck by the United States Mint and offered for sale through a network of Authorized Purchasers. These $50 gold coins will be available to members of the public seeking a simple and tangible means to own and invest in 24-karat gold in the form of legal tender coins whose content and purity is guaranteed by the United States Government. American Buffalo Gold Bullion Coins will be available at many coin and precious metals dealers as well as many brokerage houses and participating banks. Pricing for precious metal investment coins typically depends on the market price of the metal. The United States Mint will produce a proof version of these coins for collectors. The term "proof" refers to a specialized minting process that begins by manually feeding burnished coin blanks into presses fitted with special dies. Each coin is struck multiple times so the softly frosted and highly detailed images seem to float above the field. An official Certificate of Authenticity will accompany each coin. 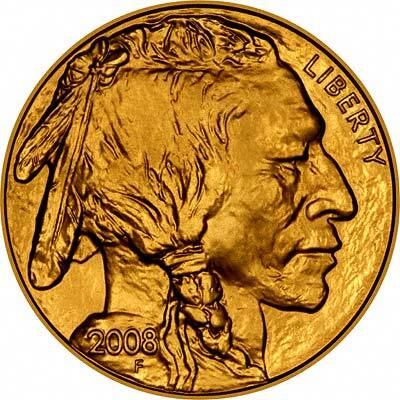 American Buffalo Gold Proof Coins will sell at a fixed price and can be purchased directly from the United States Mint. All 24-karat American Buffalo Gold coins will be struck at the United States Mint at West Point. The 24-karat American Buffalo Gold Bullion Coins will be minted and sold in the same manner as American Eagle Bullion Coins. In February 2007, one of our customers telephoned to query the "faulty " edge on his gold buffalo. We took a look at our stock, and every one was the same. Because of the realistic sculpting and relief of the coin, the edge varies in thickness between 2.6 and 3.25 millimetres. We do not consider this to be a fault, rather a design feature. *As we buy and sell one ounce buffalo our stock levels vary considerably. Due to this, when placing an order you may experience a delay of up to a few weeks. We will try to fulfil orders as soon as possible and if required we can post out an invoice upon cleared payment. When we wrote this page originally, we checked to find the correct plural of the word buffalo. After consulting a number of sources, we concluded that both BUFFALOS and BUFFALOES were correct. A year later, and we realised that BUFFALO is also a correct plural. According to one source, it is the preferred plural. While we might agree with this as far as the animals are concerned (e.g. a herd of buffalo), we consider it would sound strange and unnatural to ask for a quantity of gold buffalo, therefore it is preferable to use one of the other versions. In case Google can be taken as a guide, we note that a search for "buffalos" returns 574,000 results, but also the query "Did you mean: buffaloes". A search for "buffaloes" returns 2,2920,000 results. So "buffaloes" would beat "buffalos" by a ratio of 4:1. Please see our original news page for more information from the original announcement. We make an active market in almost all world coins, gold or otherwise, including American gold coins. If you have any of these coins to sell, please contact us, or post them to us for appraisal and offer.